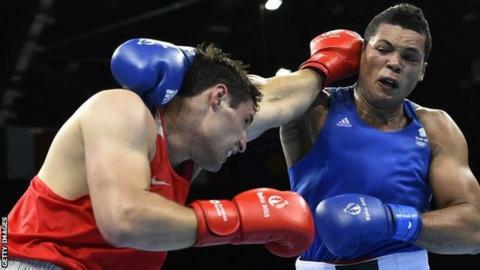 Great Britain boxer Joe Joyce beat Russian Gasan Gimbatov to claim gold in the super-heavyweight division at the European Games in Baku, Azerbaijan. Joyce, 29, was behind in the early exchanges but fought back with a superb finish in the final round. Swimmer Luke Greenbank won his second gold medal of the Games by winning the 200m backstoke title in a world junior record of one minute 56.89 seconds. The 17-year-old had already taken gold in the 100m backstroke on Thursday. Greenbank also won silver in the 4x100m mixed medley relay, alongside Charlie Attwood, Amelia Clynes and Georgia Coates. Josh Kelly lost out on a unanimous points decision and had to settle for welterweight boxing bronze. "I'm disappointed and if I boxed him again it would be different, but I've done myself proud," said the 21-year-old. What are the European Games? Read more on European Games 2015: What are they - and what is at stake?